Graduates Sbenenzile Langa and Tim Macquire together with Jill John (SAICA ED and The Hope Factory) and sponsor Jonty Bouw of Standard Bank. The Hope Factory celebrated another year of growth and excellence this past Friday 15 March, as 30 individuals graduated from their Enterprise Development and Socio-Economic Development Programmes in Port Elizabeth. 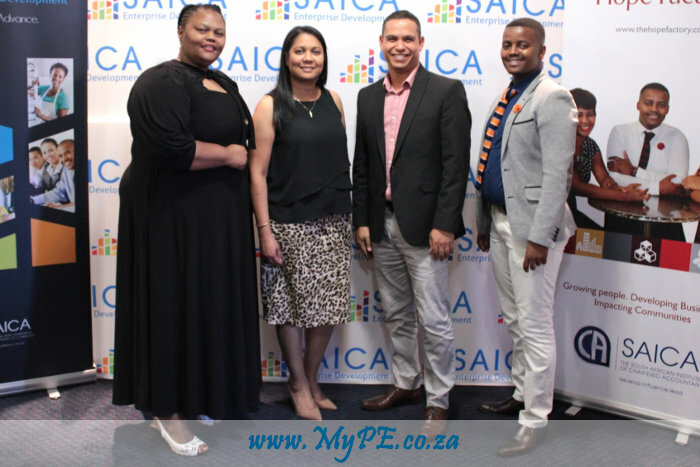 In 2018, not only did the launch of SAICA Enterprise Development (SAICA ED) take place but both entities (SAICA ED and The Hope Factory) completed a full 12 month impactful flagship programme. Graduation day is a day to revel in the successes of these SMME’s and informal traders (The Hope Factory) and we stand proudly alongside them in what they have achieved. For each of the graduates, a future awaits in which they will continue to grow and take steps towards taking their businesses to the next level. SAICA Enterprise Development believes that creating financially savvy entrepreneurs will help businesses grow sustainably, access funding successfully and ultimately employ more people. In 2018, 97% of the SMME’s on the Enterprise Development Programme said coaching improved their effectiveness and ability to achieve their business objectives. “One of the big highlights that I have learned in the SAICA ED’s Programme is the importance of being compliant and knowing your finances, budgeting and not spending your business money on personal use,” says Sebenzile Langa, Enterprise Development programme graduate. A positive 95% of the beneficiaries on The Hope Factory’s Socio-Economic Programme indicated that the programme was helpful in improving their quality of life. THF continues to create socio-economic impact through training and mentorship for informal traders focusing on personal, business and financial skills. SAICA ED and The Hope Factory would like to extend a warm thank you to our sponsor Standard Bank, for their contribution and support. Our Enterprise Development and Socio-Economic Development graduation was held at the Standard Bank offices in Newton Park, Port Elizabeth. In his closing Jonty Bouw, Small Enterprises Regional Manager mentioned that Standard Bank are proud to be associated with both The Hope Factory and SAICA Enterprise Development and that it is evident that the individuals on their programmes grow not only personally but in business and finance skills too; due to the mentoring, coaching and skills they receive. “We would like to play a greater integrated role in the community and thus are pleased to work closely with the The Hope Factory and SAICA ED”, says Jonty.